The Ramakrishna Order, with headquarters in Kolkata, is one of the largest and most respected religious orders in India today. The Order was inspired by the great Bengali saint, Sri Ramakrishna. Shortly before his death in 1886, Ramakrishna encouraged his young disciples to formally renounce the world by giving them the ochre cloth of renunciation. He entrusted the care of these young men to his foremost disciple, Swami Vivekananda, who later, in 1897, founded the Ramakrishna Order. The encircling serpent—awakening of spiritual power. The swan represents the Supreme Being or Godhead. By the union of these four paths, the vision of God is obtained. 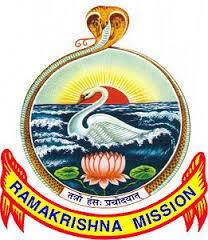 The goal of the Ramakrishna Order is written in Sanskrit on the emblem: May the Supreme Spirit illumine us. There are over 166 official centers of the Ramakrishna Order, and many more unofficial, or unaffiliated ones. These centers not only cover the length and breadth of the Indian subcontinent, but can also be found in Europe, Russia, Japan, South America, Africa, Canada and the United States. Those branches of the Ramakrishna Order located outside India are generally known as Vedanta Societies, and are under the spiritual guidance of the Ramakrishna Order. The work of the Vedanta Societies in the West has primarily been devoted to spiritual and pastoral activities, though many of them do some form of social service. On the Indian subcontinent, the Ramakrishna Mission has been in the forefront of philanthropic activities. Its first social service efforts—inspired by Swami Vivekananda—began in 1897. Since that time, the Mission’s activities have continued to expand up to the present day. The Ramakrishna Mission has its own hospitals, charitable dispensaries, maternity clinics, tuberculosis clinics, and mobile dispensaries. It also maintains training centers for nurses. Orphanages and homes for the elderly are included in the Mission’s field of activities, along with rural and tribal welfare work. In educational activities, the Ramakrishna Mission has consistently been ahead of its time. It has developed some of the most outstanding educational institutions in India, having its own colleges, vocational training centers, high schools and primary schools, teachers’ training institutes, as well as schools for the visually handicapped. It also has adult education centers through out the county. Whenever disaster has struck, the Ramakrishna Mission has been there to offer relief from famine, epidemic, fire, flood, earthquake, cyclone, and communal disturbances. India, with her wealth of spiritual tradition, has produced many spiritual giants. One of the greatest was Ramakrishna (1836-1886). His life was a testament to truth, universality, love and purity. Born in a rural village outside Calcutta, Ramakrishna even as a boy naturally gravitated toward leading a spiritual life. This tendency only intensified as he grew older. When as a young man he became a temple priest, he was seized by an unquenchable thirst for union with God, and he immersed himself in intense meditation and other spiritual practices. Ramakrishna was constantly absorbed in the thought of God. He would often go into high spiritual states where he would merge with the Infinite Reality. For him, the Vedantic teaching of unity of all existence was more than theory; he literally saw, and knew, this to be true. In his thirst for the divine, Ramakrishna followed different religious paths including various branches of Hinduism. Not content to stop there, however, he also practiced Islam and later meditated deeply on Christ, experiencing the same divine Reality through these non-Hindu paths. Thus, he came to the conclusion, based on his direct experience, that all religions lead to the same goal. In addition, through his many Sikh devotees, he learned of their faith and its great founders, and he was told of the wonderful life and teachings of the Buddha. This exposure to Sikhism and Buddhism further confirmed his experience of the universality of spiritual truth. Ramakrishna’s love for humanity was limitless. He often said human beings were the highest manifestations of God. His disciples saw this love firsthand, and the monastic order Ramakrishna inspired achieved the distinction of being the first order in India to serve humanity. Service to God in humankind is one of the foremost ideals of the Ramakrishna Order. Among his many other noteworthy characteristics were his universality and childlike purity, his intense sincerity, his vast knowledge of things spiritual and human (which came not from book-learning but from direct perception), and his extraordinary power to transform lives. Ramakrishna’s teachings regarding the highest truths of spiritual life were delivered in the simplest language and were punctuated by parables and homely metaphors as illustrations. Many noted writers and philosophers—Mahatma Gandhi, Leo Tolstoy, Aldous Huxley, Christopher Isherwood, Thomas Merton, Arnold Toynbee, Joseph Campbell—have been deeply impressed and influenced by him. The affectionate term “Holy Mother” refers to Sri Sarada Devi (1853-1920), Ramakrishna’s wife and spiritual counterpart. According to the custom then prevalent in India, she was betrothed to him while still a child. At the age of 18, she left her parental home to join her husband, who lived some sixty miles away, near Calcutta. By that time Ramakrishna had dedicated his body and mind to the spiritual search and lived the life of a monk. Yet he received Sarada very kindly, feeling that Divine Providence had brought her. After nursing her to recovery from an illness contracted on the journey, Ramakrishna one day asked her why she had come to join him. She replied that she had come only to help him in his chosen way, which—as she well knew—meant the way of complete renunciation of all earthly ties for the sake of God-realization. Thus, instead of seeking conjugal fulfillment, she became his first disciple. Sarada Devi was a spiritual giant in her own right and yet, in her simple and unassuming way, she served Ramakrishna and his disciples for many years. After Ramakrishna’s passing away, she carried on his religious ministry, serving as guide and inspiration of the new spiritual movement. Within the ambiance of her natural simplicity and modesty, she set a unique example of an ideal disciple, nun, wife, teacher, and also mother to her countless spiritual children. Those who associated with her were overwhelmed by her unconditional love and selfless service. All were her children irrespective of nationality, religious affiliation, or social position. No one was ever turned away. She accepted all.